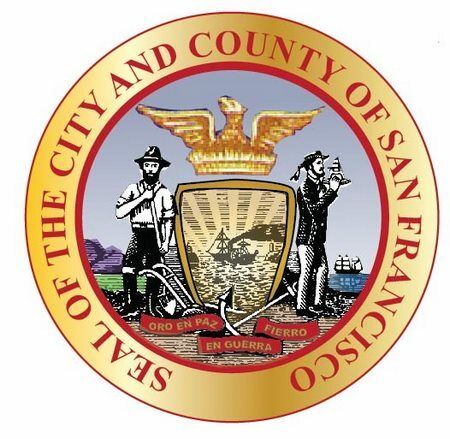 The City and County of San Francisco shall have an official flag to be known as ‘The Flag of San Francisco’. The flag shall be as hereinafter described, to-wit: ‘A Phoenix rising from the flames, below which shall appear the motto Oro en Paz—Fierro en Guerra’, both in a golden yellow hue on a field of white, with the Flag itself bordered with gold. The words San Francisco shall appear horizontally along the lower portion of the Flag, below the Phoenix and the Motto, in letters of appropriate size, rich blue in coloring. The wings of the phoenix are outspread and pictured above a ring of red flames, resembling an open crown, with eight points outlined in golden yellow. The scroll is segmented into three sections and is bordered in black to separate it from the white field. The Spanish motto means “Gold in Peace, Iron in War”. The width of the gold border is one-eighth the height of the flag. In the words of Mayor Phelan in 1900, "It is singularly appropriate by reason of the fact that California is the Golden State and San Francisco has become the point of debarkation for our troops [in the Spanish-American War] …Gold is emblematic of the abundance of nature, and iron of the fortitude and courage of men; but when the war ceases let us hope that the productive industries … may permit us to read the inscription, ‘Gold and Iron in Peace.’"
This motto, however, predates the Spanish-American War, appearing on a seal dating from 1859 (perhaps anticipating the Civil War). Others attribute the origin to Don Quixote and his instructions to Sancho Panza. The phoenix first appeared on a seal in 1852 as a crest to symbolize the city’s resurgence from an earlier fire (Kenneth M. Johnson, California Governmental Seals, Castle Press, 1963: No. 8). The phoenix is a symbol of human aspiration and achievement, a mythological bird that lives for 500 years, then is consumed by flames and rises again from its ashes. In an alternate interpretation, the phoenix represents the city’s emergence under the 1856 Municipal Consolidation Act as a city and county separate from San Mateo County. In any case, the symbol was unintentionally prophetic, as the flag was adopted six years before the great earthquake and fire of 1906. Chosen in a competition initiated by the mayor, James D. Phelan. He appointed as judges the commissioner of public works, the parks commissioner, and three members of the board of supervisors. The winning design was selected from among over 100 entries. Flag adopted: 14 April 1900 (official); revised 30 December 1940. Policeman John M. Gamble won the prize of $50 for his design. Further Resolved, That the words San Francisco be placed horizontally along the lower portion of the Flag, below the Phoenix and the Motto, in letters of appropriate size … so that the Flag will be blue and gold on a field of white, symbolic of the blue skies of San Francisco, the gold of her commerce and industry and the white of her pure purpose to be a city of happy homes and contented, prosperous people. About the yellow border: the original flag was white with the Phoenix/motto, and a yellow FRINGE. When it came time to mass produce the flag, the yellow fringe somehow became part of the design of the flag itself. Then when an indoor flag is needed, you guessed it, it gets yellow fringe in addition to the yellow border! On January 8, 1900, San Francisco Mayor James D. Phelan addressed the S.F. Board of Supervisors, and as reported in the San Francisco Chronicle of January 9, 1900, stated: "I recommend to the Board finally to adopt a flag for the city of San Francisco. Other cities have their ensigns. Upon ours should be inscribed the sentiment now upon the city's seal. Oro en paz fierro en guerra. It is singularly appropriate by reason of the fact that California is the Golden State and San Francisco has become the point of debarkation for our troops, whose heroic work in the Pacific has been the principal event of the closing century, and our own California boys, mustered in San Francisco, were the first to the front [in the Spanish American War]. Gold is emblematic of prosperity and iron emblematic of fortitude and courage and when the war ceases we hope that productive industries and prosperity, of which iron is also emblematic, may permit us to read the inscription, Gold and iron in peace." The Chronicle reported that Mayor Phelan had won a $50 prize for an article he had written on "How to Make Corporations Pay Their Taxes", in an article of February 21, 1900, "and at once offered to give the $50 as a reward for the best design to be submitted for a municipal flag, which he has for some time advocated." On March 17, 1900, the San Francisco Chronicle reported in its editorial column, being no friend of Phelan: "By invitation of Mayor Phelan, designs are being submitted for a municipal flag. Competitors may choose a guinea pig, a rat or a monkey as the central figure." On April 15, 1900, the Chronicle announced the selection of a design for the San Francisco flag, the design of John M. Gamble, stating: "A design for a municipal flag was yesterday [4/14/1900] selected from among some fifteen designs placed in competition before the Commission appointed for the purpose of recommending the most appropriate civic banner to the Board of supervisors .... Action by the Board of Supervisors will be necessary before the flag is regularly adopted as the official banner of the city, and it is probable that this action will be taken on Monday ...." The design is shown, along with Gamble in line drawings accompanying the article. The flag as designed does not bear the yellow border, nor any other border, nor the words "SAN FRANCISCO" as does the present flag. In an April 19, 1900 Chronicle article it was reported that Mayor Phelan had transmitted the flag design to the Board of Supervisors for adoption, with the adoption issue coming before the Board on the following Monday at its regular session. The Mayor is reported to have stated: "New York and other cities have such flags, which are used on appropriate occasions. The desirability of a city ensign occurred to me during the reception of the troops returning from the Philippines last fall, when the city tug, which met every returning transport, had no official mark of identification." The San Francisco flag appears to have been first displayed publicly during the annual San Francisco police inspection parade held on or about May 1, 1900 [ I can't immediately find the date of the Chronicle's report of the parade]. The flag is displayed in a line drawing accompanying the article, upon a staff. The mayor delivered a silken San Francisco flag along with the national flag. I have seen a photograph of what I believe to be this parade, with the San Francisco flag displayed on a staff. The original city flag had a plain white field, and was entrusted to the chief of police in May 1900 for use in parades and ceremonies. According to tradition, it was rescued in a paddy wagon from the flame-engulfed city hall in April 1906. That flag was replaced by a duplicate in 1926. In 1940, when pre-war patriotic fervor led the board of supervisors to authorize making more than one flag, the drafter of the specifications described the gold fringe of the 1926 ceremonial flag with the phrase bordered with golden yellow. This misinterpretation added the golden border to the flag’s otherwise white field. The City of San Francisco's original flag is illustrated in the SF Municipal Almanac 1899-1900 edition. This flag was described as white with a black phoenix and scroll, with golden yellow flames, lettering and scroll reverse. There is no mention of fringe. A slightly different image appeared in the SF paper on April 15, 1900. This flag is also shown without fringe. Both flags are shown with 8 points on the flames. This flag was used by the SF Police Department in parades and ceremonies. In 1926 the flag was described as no longer serviceable and a replacement flag was sought. This flag was replaced with a flag in 1929, an illustration of which appears in the Oct issue of Overland Monthly. Note the appearance of fringe. In 1940 the flag was placed before the S.F. Board of Supervisors to be officially adopted, which it was on 16 December 1940. The flag in City Hall was yet another version also bearing fringe. The fringe was described as "bordered in gold." This is the origin of the golden yellow picture frame border shown on the Museum of San Francisco's web site. Both of the flag manufacturers in San Francisco, The Emerson Flag Co. and The Paramount Flag Co. began to produce versions of the flag. Paramount's more closely complied with the ordinance, Emerson's was more embellished, three colors in the flames and serifs on the letters. In 1963 Mayor George Christopher identified the Paramount design as the "official flag". Note the two color flames and the San-serif lettering. Both versions are still in use at City Hall. In response to an inquiry about a flag seen flying at Pacific Bell Park during a World Series game, Renee Dunn, Manager, Communications, Port of San Francisco, wrote "The white flag that you see at Pacific Bell Park is indeed the Port of San Francisco's logo. The building does represent the Ferry Building, which is the centerpiece of our waterfront. The ballpark is on port property and the SF Giants have authorized flying the Port's flag." The tower in question is the San Francisco Ferry building, formerly a busy auto and passenger ferry landing, now again serving smaller passenger commuter ferries and as headquarters for the SF Port Authority. It is a well known San Francisco landmark. B.A.R.T. is the acronym for the San Francisco Bay Area Rapid Transit operating in the San Francisco/Oakland area. BART is a public transit system, which makes it basically a government agency. The Board of Directors are elected in public elections representing various areas of San Francisco, Alameda and Contra Costa counties. The system operates computer controlled trains on six foot gauge track with third rail electrical pickup. One interesting feature is the Oakland to San Francisco tube, a two track bore running 265 feet under the San Francisco Bay for about 7 miles. The flag is almost an LOB. The logo for BART is a black lower case 'b' and a light blue/teal 'a' in a white background the "BART' in black letters above the 'ba'. The flag is a light blue/teal rectangle (3:5) with the black 'b' and a white 'a' without the 'BART' portion of the logo. The logo can be seen on the BART web page at www.bart.gov. The Golden Gate Ferry Service (GGF) is part of the larger Golden Gate Transit System (GGT), also known as the Golden Gate Bridge and Highway District, which is responsible for public bus and ferry systems in the San Francisco Bay area, including the Golden Gate Bridge itself. Although crossing the San Francisco Bay by ferry dates back to 1850s when ferryboats began operating between the city of San Francisco and other Bay Area communities, the modern GGF system was started in 1970. The GGF fleet currently has a fleet of 7 vessels that connect San Francisco with Sausalito and Larkspur in Marin County. The GGF works in conjunction with other Bay Area transit operators such as the Blue and Gold Fleet (usually called the Tiburon Ferry) and even schedules a popular "Golden Gate Giants Ferry" which takes Bay Area baseball fans directly to AT&T Park for all San Francisco Giants home games. In 1868, the Sausalito Land and Ferry Company purchased waterfront land in Sausalito and proceeded to layout streets and subdivide the central waterfront into view lots. They also began to operate ferry service between Sausalito and San Francisco as a promotion for real estate development. The Princess, a small steamer was the first Sausalito ferry to serve San Francisco. The Northwestern Pacific Railroad connected to the Sausalito Ferry Terminal and they eventually purchased the ferry company. Sausalito soon became a major Bay Area transportation hub, but in 1920, due to the unresponsiveness of the Northwestern Pacific Railroad to the demands for auto ferries, a new ferry company, the Golden Gate Ferry Company, was inaugurated and offered auto ferry service between San Francisco and Sausalito. Following the opening of the Golden Gate Bridge in May 1937, ferry service between Marin and San Francisco declined and eventually came to an end in 1941. For the next 29 years, driving across the Bridge was the only way to travel directly between Marin and San Francisco. However, as the traffic congestion continued to increase, a number of studies were undertaken to identify alternate means of travel between Marin County and San Francisco, and in 1969, the California State Legislature passed a bill authorizing the formation of a Golden Gate Bridge and Highway District, tasked with developing a mass transportation program (buses and ferries) along the U.S. Highway 101/Golden Gate corridor. This included a new commuter passenger ferry system between Marin and San Francisco. This public transit network is commonly known today as Golden Gate Transit (GGT) and Golden Gate Ferry (GGF). They have become an integral part of life in the North Bay counties of Marin and Sonoma, and continued to fulfill the mission of reducing automobile traffic and congestion while contributing to the protection of the environment with efficient, reliable and cost-effective alternatives to the private automobile. The flag is blue with a white border. Blue symbolizes the sky and the ocean. In the center is a dove symbolizing that Goans are peace-loving at heart. The word GOA appears in the center of the dove. The words JUSTICE appears at the top of the flag and TRUTH at the bottom in orange letters, orange symbolizing the sun. The words EQUALITY appears on the left and FREEDOM on the right in green letters; green symbolizing the earth.